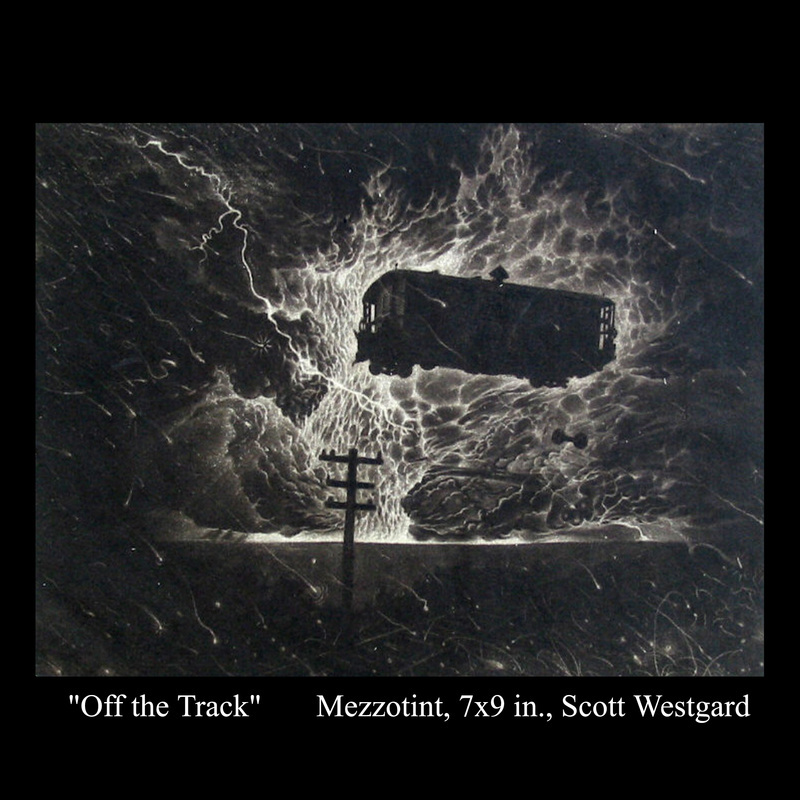 Small and miniature intaglio prints and paintings by Scott Westgard, all images copyright by the artist. I enjoy pursuing many mediums including painting, colored pencil, 3D assemblages, pen and ink, and even digital arts. 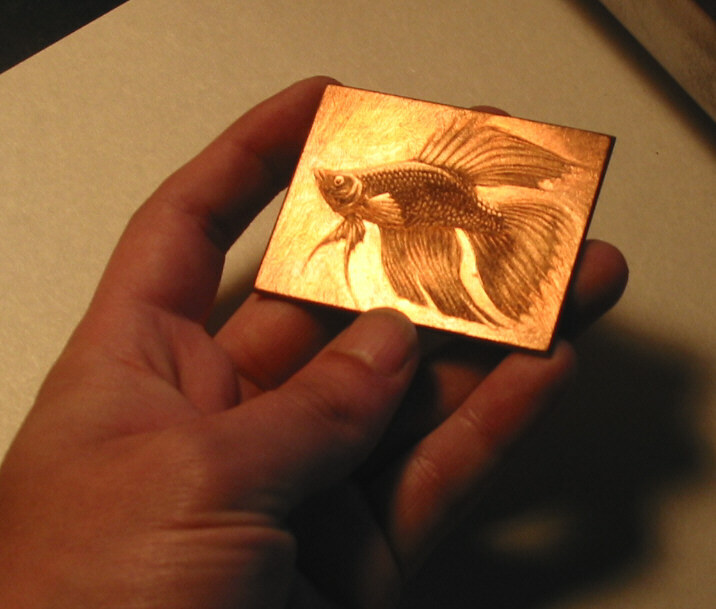 My favorite, and most prolific medium, is intaglio printmaking, namely etching, engraving and mezzotint on copper plates. I have a small etching press, and work primarily out of my home. I have always been fascinated by miniatures, and most of my work is small, intimate, and detailed. I like art that draws a viewer in close, and then rewards them with an enlightening, humorous, or surreal experience. Though I have explored many subjects, I feel that mankind’s awe of, and interaction with nature has inspired a good deal of my images. Many of my works are commentaries on such relationships. I also have a fascination with clouds and storms. most of my larger pieces including monotype prints and paintings deal with the beauty of light and atmosphere, sometimes juxtaposed with angular and somewhat cubist architecture. This technique utilizes a thin metal plate into which an image is inscribed by various means. Once complete, the plate is covered in ink, filling the image areas and lines on the plate. The ink is then wiped away carefully so that only the ink down in the inscribed areas remains on the plate. The plate is then printed onto dampened paper with an etching press. With a piece of soft felt over the paper, the high pressure of the press forces the paper down into the inscribed lines, thus printing the image. This process often shows a plate mark embossed into the paper around the edges of the plate. Etching: An artist uses a varnish “ground” as an acid resist layer over a plate, then draws through the ground with a needle to expose the metal. Special acids then are used to “bite” the plate wherever lines are drawn, creating depressed lines controlled by how long a plate is left in the acid bath. Engraving: An artist physically cuts lines into a plate using a chisel-pointed “burin” hand tool. Mezzotint: An artist uses a “roulette” or “rocker” tool with tiny teeth on it to create pitted surfaces on a plate which print as shades of grey or black. Aquatint: Though I do not use this technique much, it is a process where a fine rosin is baked onto a plate, allowing for a random pitted surface to be etched in acid. Various shades of grey are created by etching the plate for different lengths of time in an acid bath. 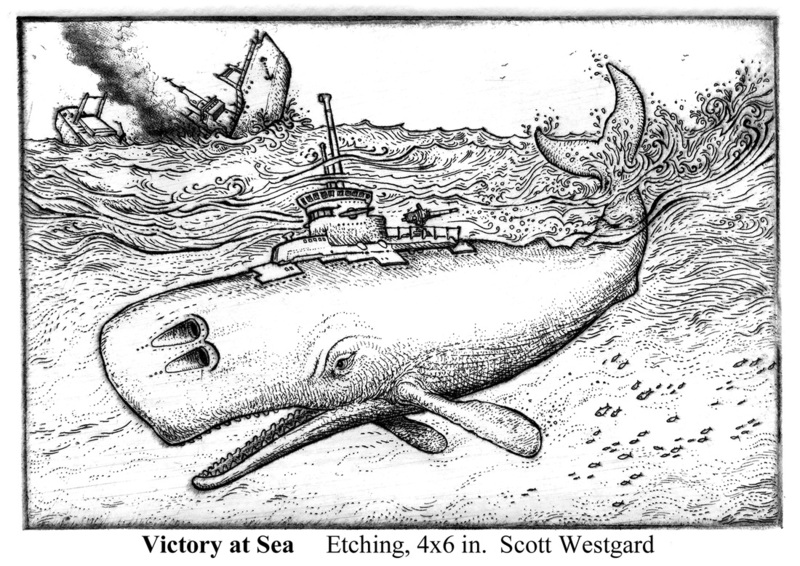 "Victory at Sea" is one of many of my etchings showing the struggle between man and nature. 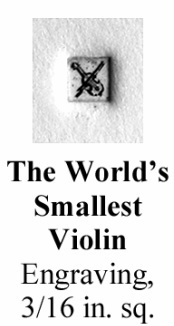 "The World's Smallest Violin" a "micro - engraving" print, clearly showing how it is embossed into the paper. 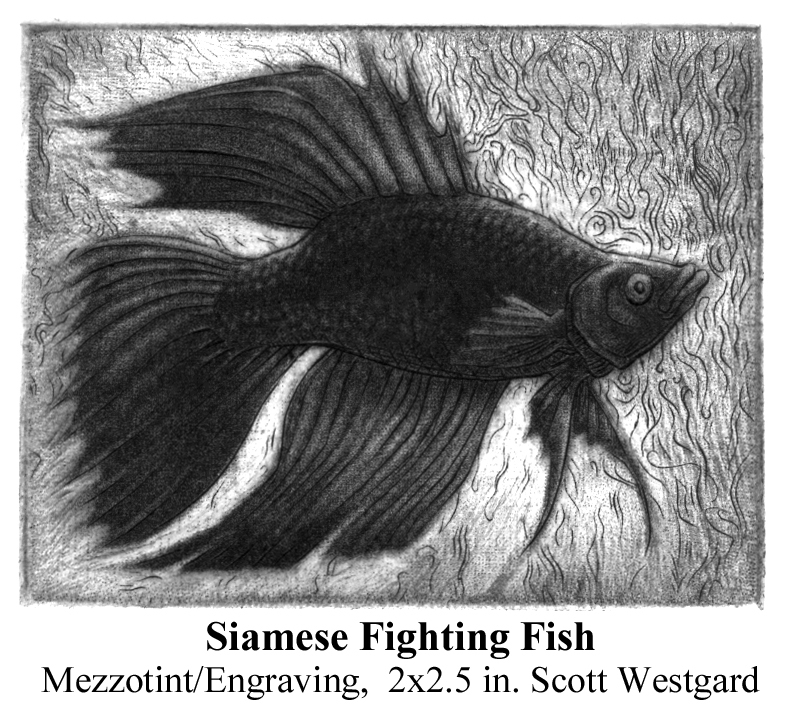 Mezzotint plate with fish image. 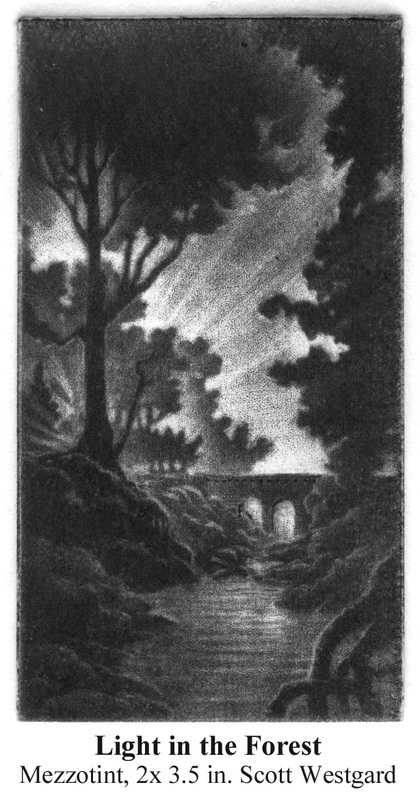 The printed mezzotint/engraved image from the plate shown above. My prints are printed on acid-free paper and are usually signed as A/P or "Artist Proof" in open ended editions. 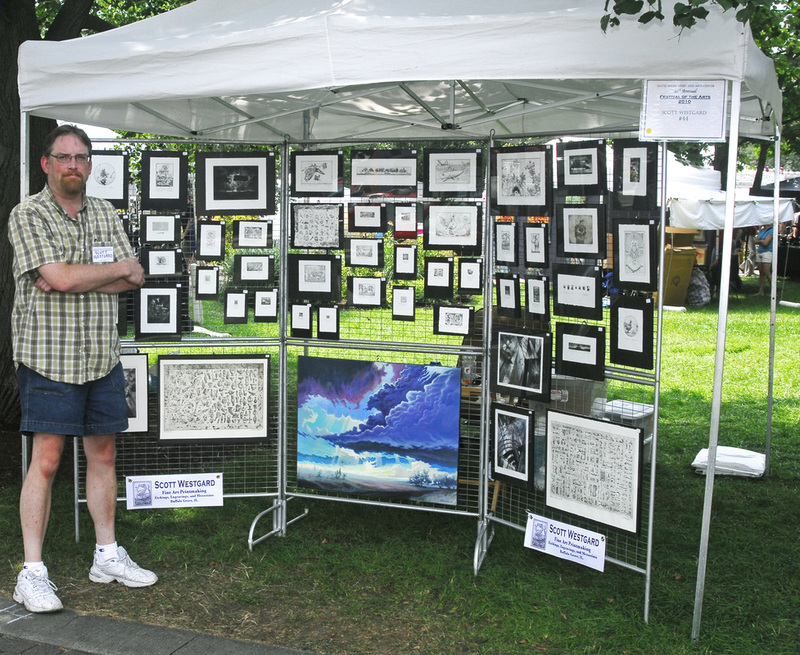 Since I print and sell my work myself, I prefer to print them on demand for customers and art festivals. This means when I'm dead, sadly, there will be no more. Most of my small prints range from $20 to $100. I accept PAYPAL and checks by mail for prints. 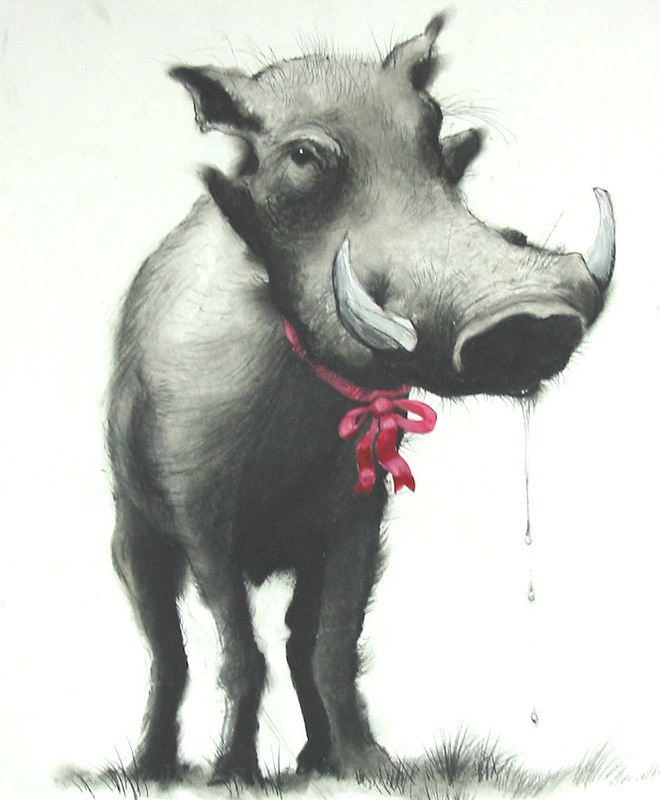 I prefer to ship prints unframed, since it is much easier, cheaper, and avoids damage to glass and delicate frames. Please inquire for prices and availability.